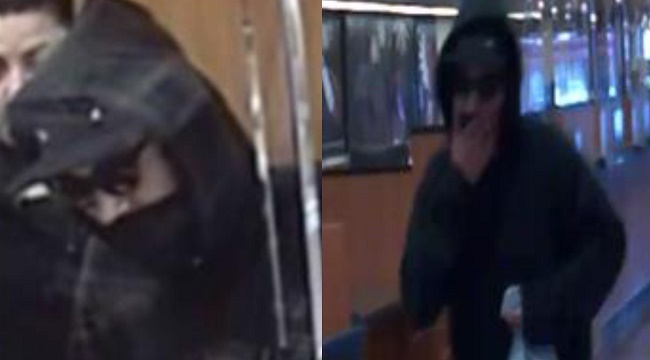 Authorities asked the public Friday for help in identifying a masked bank robber believed to have targeted two San Diego-area financial institutions in the last several weeks. The crimes occurred at a Wells Fargo office in the 7800 block of Highland Village Place in San Diego on Nov. 20 and at a Chase Bank office in the 100 block of Palm Avenue in Imperial Beach Tuesday, according to the FBI. In both cases, the masked thief, who appeared to be about 20 years old, verbally demanded cash from multiple tellers before fleeing with undisclosed amounts of money, the federal agency reported. Witnesses described him as a thin, roughly 5-foot-7-inch, 140- to 170- pound Latino with a bandana over his lower face and wearing sunglasses and a hooded jacket. Anyone with information about either robbery was asked to call San Diego Crime Stoppers at (888) 580-8477. Tipsters may remain anonymous and could be eligible for a reward of up to $1,000.